Mint was never really a favorite herb of mine.Part of the reason why i disliked it was because I had tasted more of mint flavored products than the real deal.So whenever the mention of mint came,I started getting a toothpaste/mouthwash smell,gross right.But all it took to change that was the small herb garden in our balcony. 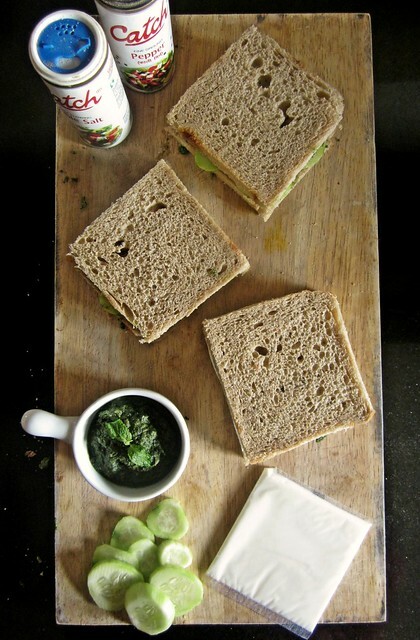 Something like,fruit of your labour?I started liking mint and thought of ways to introduce it in our menu.Ajay has been reminiscing a lot about the mint sandwich that his amma made during their picnics and outings.I've been thinking to make a sandwich for a while too for the blog so what better way to incorporate both ideas than this one. I had planned to make the sandwich from scratch,starting with the bread.I am still stuck in a Hokkaido Bread hangover.But I knew the sandwich idea might get postponed so got a packet of brown bread and set out to make the chutney.Mint chutney is quite versatile too-smear it on a bread or even dosa and add it to raita or pulao,having a bowl of mint chutney in the fridge can really give you new recipe ideas,believe me! 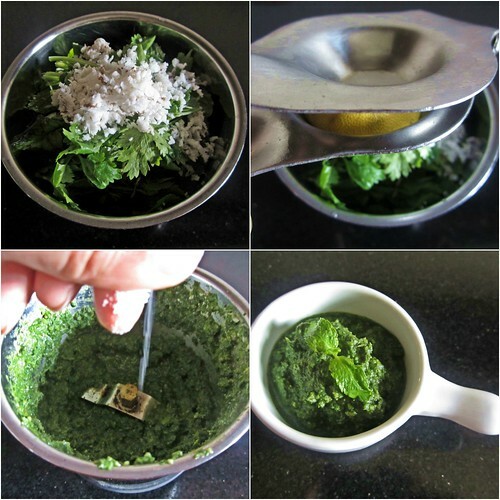 Blend together to a smooth paste the ingredients given for the chutney. If not using immediately,store in an airtight container and keep refrigerated. 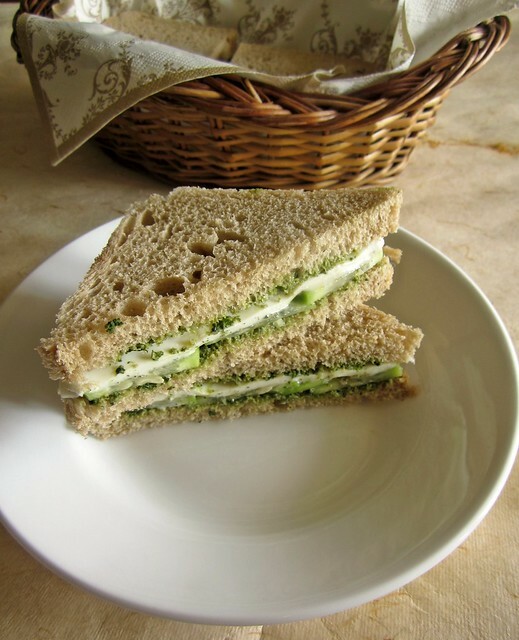 Smear the mint chutney on the bread slices.Keep sliced cucumber on top,add salt and pepper to taste and top with a cheese slice. 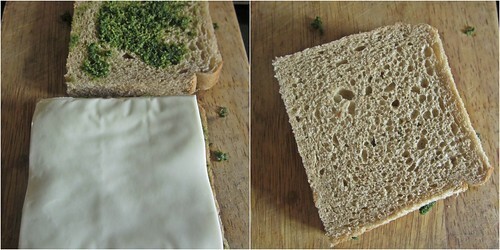 Cover with another bread.Repeat with the rest of the bread slices. 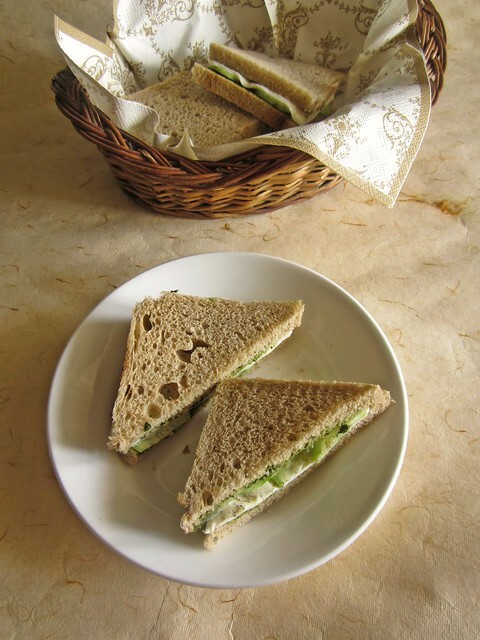 Chill the sandwich for 25-30 minutes for a refreshing and delicious sandwich. It tastes great toasted too-just butter the outside part of the bread and toast on a hot tawa or a sandwich maker until golden brown.Perfect for kids' lunchboxes or even as a tea-time snack. P.S- I've used brown bread,you can of course use any bread of your choice! 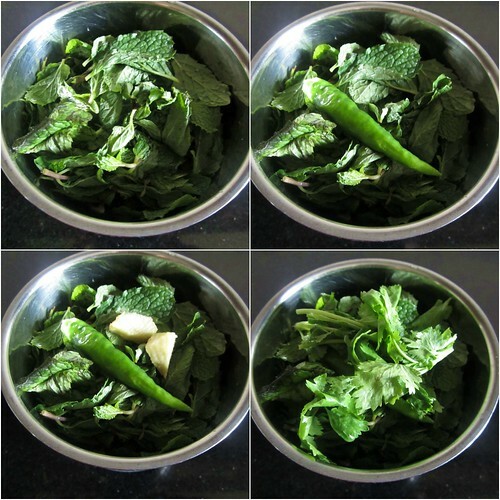 Delicious and healthy looking chutney. 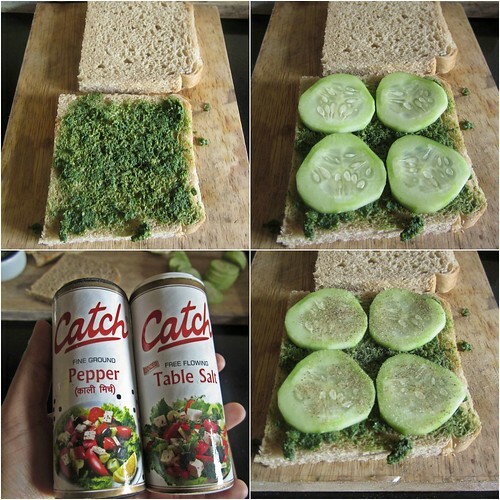 simple and super tempting sandwich. Super filling and highly flavourful sandwich. Thank you Divya for a wonderful easy sandwich. I have been looking for some healthy lunch box recipes and I bookmarked it as soon as I saw this! Mouth watering sandwich. Green looks good.